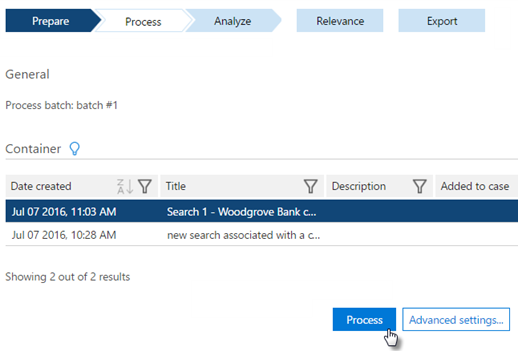 This section describes the functionality of the Advanced eDiscovery Process module. In addition to file data, metadata such as file type, extension, location or path, creation date and time, author, custodian, and subject, can be loaded into Advanced eDiscovery and saved for each case. Some metadata is calculated by Advanced eDiscovery, for example, when native files are loaded. Advanced eDiscovery provides system metadata values, such as Near-duplicate groupings or Relevance scores. Other metadata, such as file annotations, can be added by the Administrator. Batch numbers are assigned to a file during Process to allow the tracking of files. The batch number also enables identification of Process batches for reprocessing options. Additional filters are available for filtering by batch number and sessions. Perform the following steps to run Process. Open the Office 365 Security & Compliance Center . Go to Search & investigation > eDiscovery and then click Go to Advanced eDiscovery. In Advanced eDiscovery, select the appropriate case in the displayed Cases page and click Go to case. In Prepare > Process > Setup, select a container from the list of available containers. Click Advanced settings... if you want to add the container as seed files or as pre-tagged files. Use seed files to accelerate training for issues with low richness (usually 2%, or less). For seed files, it is recommended that you select a variety of distinctly relevant files and process about 20-50 seeds per issue (too many seed files can skew Relevance results). Seed files should be reviewed by the same person who will train the issue. Use pre-tagged files to automate Relevance training. You should tag at least 1,500 files, and keep the proportion of relevant to non-relevant files the same as in the collection added to Relevance. These files should be manually tagged, and you should be confident in the quality of tagging. Choose Mark as seed files to mark the container as seed files. You also need choose to assign them per issue from the For issue drop-down. Choose either Relevant or Not relevant from the Tag drop-down. Once you set files as Seed, you cannot mark them as Pre-tagged. Choose Mark as pre-tagged files to mark the container as pre-tagged files. You also need to assign them per issue from the For issue drop-down. Choose either Relevant or Not relevant from the Tag drop-down. Once you set files as Pre-tagged, you cannot mark them as Seed. In the Email tagging section. 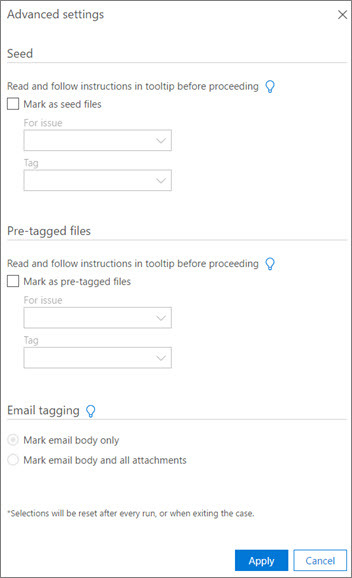 set which part of a processed email are to be marked as Seed or Pre-tagged. To begin, click Process. When completed, the Process results are displayed. (Optional) If you need to assign data sources to a specific custodian, you can add and edit custodian names in Custodians > Manage and assign custodians in Custodians > Assign. If you add to the case, then you can process again.